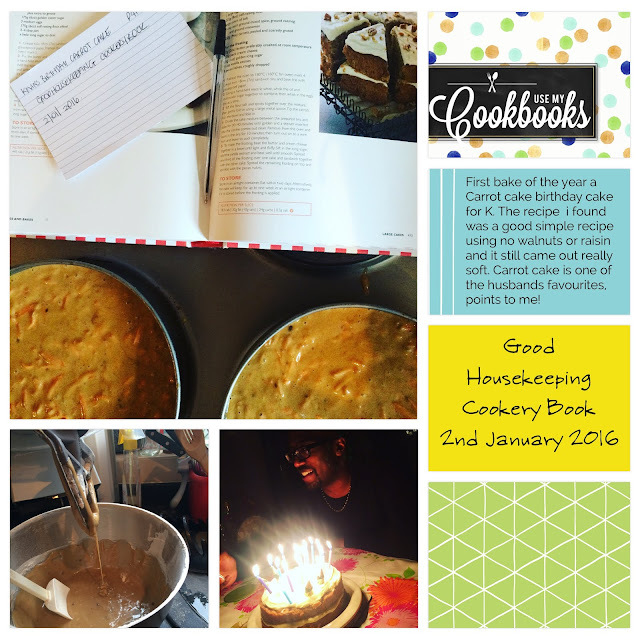 First post of the new year - and first day of hitting my self imposed target for the year to use my cookbooks more. So even if the rest of the year is a failure, one new recipe to my tired, one cookbook used and first bake of the year is done. I'm going to try and do these layouts for each one using the projectlife app - again this is the early stages. It might end up with a nice photobook at the end of the year? The big fella loves carrot cake, and this was a really quick bake. Everyone enjoyed the cake - so that is a win. Its from Good Housekeeping Cookery Book which is a lovely book, covers off lots of bases from mains, to starters, meat dishes, veg dishes and of course some baking too. It will be getting another use this year I am sure!. One way I will be trying to keep track of what books I've used and when, I got myself a list book from paperchase which is basically some pretty post it notes (like this one). I can stick them in the books, to mark when I made the recipe. By the end of the year it should look pretty impressive - I hope. I think also I need to broaden my cookbooks with some more types of cuisine, I'm a sucker for a family cookbook or a baking one. However I shall be looking for some particular types of books - any suggestions let me know. I am really liking this idea - it is too easy to look online for a recipe instead of on the bookshelf.